Motivating you to: Practice oral care! Today’s motivational topic is really important. Oral care!. It’s something certain people don’t give the much needed attention/time to. What you don’t know is that not taking care of your teeth can lead to serious health risks. I am talking about heart disease and strokes! 1) Brush your teeth atleast twice a day – People obviously brush in the morning but don’t seem to find it important to brush in the night!. Everything that you ate throughout the day, leaves food particles on your teeth. So, it’s really important you brush at night. Otherwise, the bacteria (that are ever present in your mouth) feasts upon those food particles. Plaque, which you see as a film over the teeth but what’s not visible to the naked eye, is that it’s proliferating with bacteria which are trying to adhere itself onto the teeth. When you brush everyday, not to mention twice, you thwart their chances of adhering to your teeth. 2) Tongue should be scraped everyday too because the millions of taste buds on it gives ideal hiding place for all the bacteria. 3) Floss daily. I see really less people doing this. You will be surprised that you missed quite some with the use of only a toothbrush. A brush can’t reach in between the each tooth. That’s what floss is for. 4) Use an anti-bacterial mouthwash. It helps keep mouth feeling fresh and you can fight against bacteria. 5) Visit a dentist at least once in a year. S/he will help you keep your teeth in the best condition. A clean up is always helpful. The main thing you will notice when you don’t take care of your teeth is bleeding gums. It is called gingivitis. The ‘gingiva’ is the gum and ‘itis’, as I mentioned in another post of mine, means inflammation. So your inflamed gums start bleeding when you brush. The gums start looking redder and instead of staying close onto the teeth, it starts loosening around the teeth. That is only the starting actually. Because after this, the acids produced by the bacteria while it breaks down the food particles (particularly sugary stuff) will affect the bone density. Basically the very platform that holds your teeth together. This is advanced case that I am talking about. Don’t panic. Well, if you wait until you get to this point, you start losing teeth because it doesn’t have a platform to stay rooted to. At this stage, it’s called periodontal disease. On the left, you see how the healthy gums hug the tooth and stays snugly close. 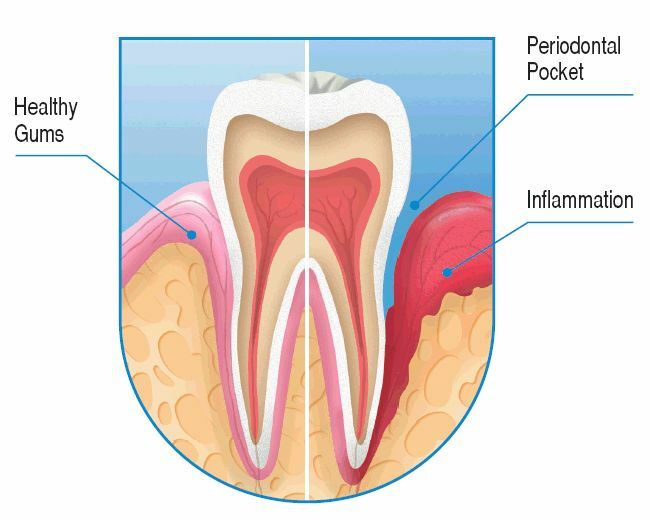 But once affected, as shown in the pic on the right, between the gums and the tooth there is a gap/pocket. The bone density is much lesser than on the left. Most of them is new pack in this pic, because these are all the (backup) ones that I have bought to take with me to India. Brush : I love Oral B (on extreme left) and Sensodyne (on the extreme right). I had gingivitis some time back and that’s when I started using brushes with “Soft” bristles. Before that it always used to be “Medium” bristles. Oral B has been my favorite for a long time. I always get the twin pack which costs about AED 19.75. 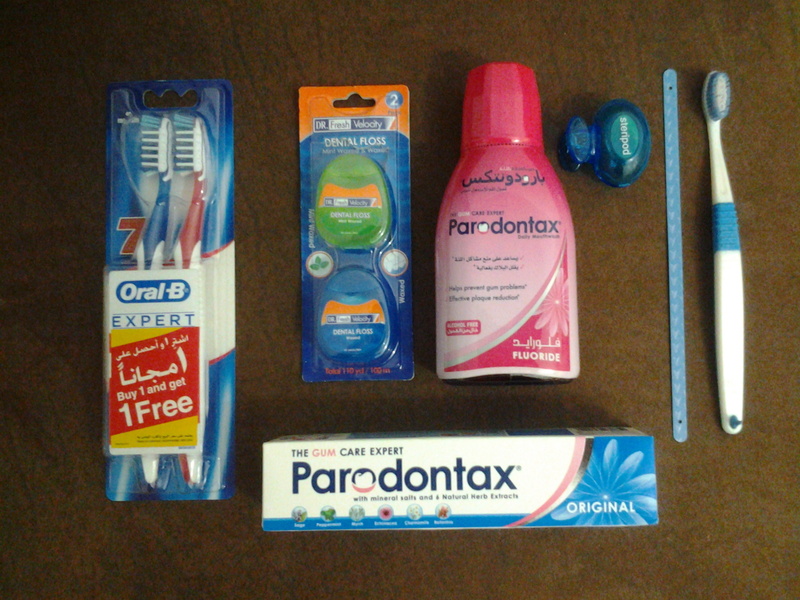 The Sensodyne one has a small head which you can maneuver easily in your mouth and is about AED 16 or 17, I believe. Remember, to change your brush every three to six months. Toothpaste : I have always liked Signal however, of late I have switched to Paradontax, which is named as a Gum Care Expert. I always choose the Original one, which has Sage, Peppermint, Myrrh, Echinacea, Chamomile and Ratanhia in it. All of them are excellent against fighting gum diseases. It has a unique herbal taste. Price in Lulu : AED 21 / Price in Carrefour: AED 22.50 for a 100ml tube. However, last time I visited, the store didn’t have it, so I chose Dr. Fresh Velocity twin pack which contains one Mint waxed one and another Waxed one. It’s shown in the pic with all the items above. 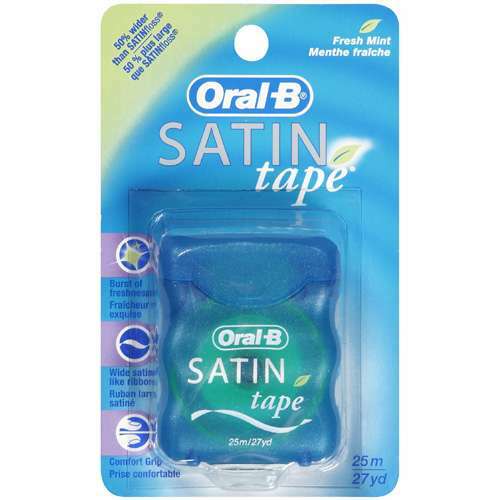 It’s OK but once it’s over (because I don’t wanna waste anything), I will go back to Oral B Satin Tape. Price of Dr. Fresh Velocity twin pack in Carrefour and Lulu : AED 9.95. Mouthwash : Listerine is the known brand when it comes to mouthwashes. It’s so popular. But once I switched to Paradontax toothpaste, I chose the Paradontax mouthwash from then on because using products from the same brand helps maximize it’s effects. Also, what really attracted me to this mouthwash is that it’s alcohol-free. Listerine has alcohol in it and when you use it, your teeth and gums get this numbing feeling for some time. I hate that. With Paradontax, the numbness is not there. It comes in different flavors. The one that I like is the pink bottle with Flouride. Tongue cleaner: I use the good old plasticky stick shown in the first pic. It costs only AED 0.50 or a maximum of AED 1. However, if you want to try tongue scrapers which look like the one I clicked a photo of, at a supermarket, you can. These kinds of scrapers cost anywhere between AED 9.95 – AED 15 in both Lulu and Carrefour. 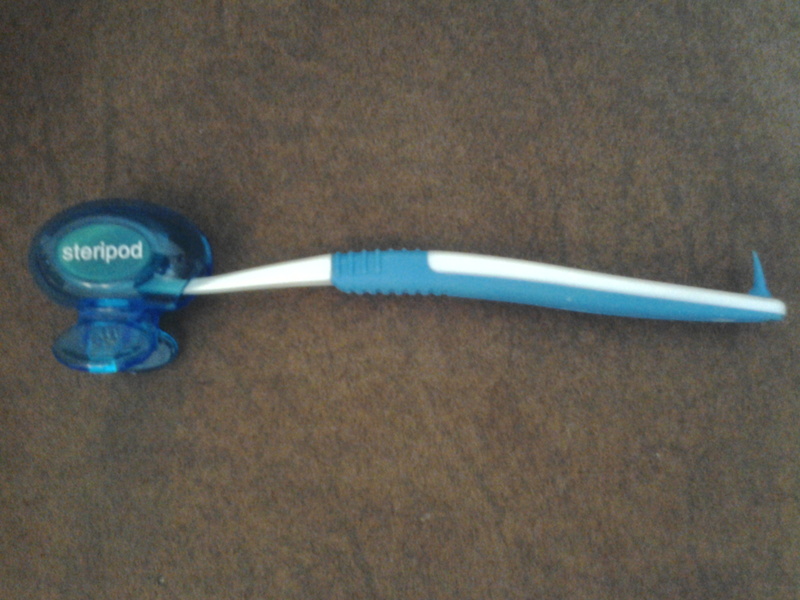 Steripod – A cover for your toothbrush is a must. Once you use it and keep it in a holder, it’s still moist and that is exactly the kind of environment that helps bacteria thrive. You don’t what additional bacteria from the atmosphere to settle on it, do you?. Steripod is a product that got released in US first and recently in the UAE. 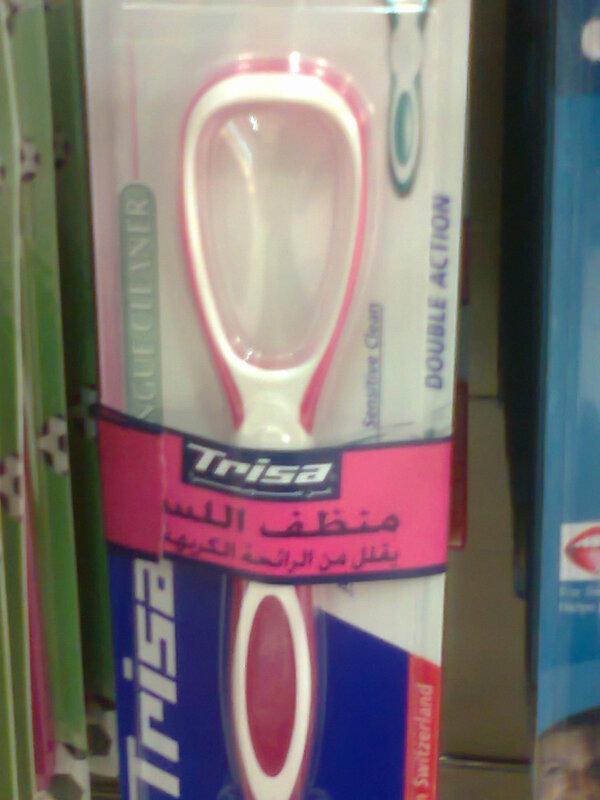 It attracted me because apparently it contains something that avoids bacteria from thriving on your toothbrush. It’s validity is 3 months, whereby after that it’s “magic” is over. But you can still use it as a cover for your toothbrush. You can buy a single one, available in different colors, at Lulu for AED 15.25 and in Carrefour for AED 13.25. All in all, I want you to take care of yourself, be more dedicated to oral care. You will reap the benefits by staying healthy.